Crowdfunding. Some think it’s ‘easy money’ compared to angel and VC funding. Others are too intimidated by the prospect of campaigning to even get started. A healthy perspective to crowdfunding lies somewhere in the middle. At our Crowdfunding Hacks event, attendees learned valuable tips for crowdfunding success from representatives of the UK’s top crowdfunding platforms: Magda Posluszny from Seedrs, Cornelius Riethdorf from SyndicateRoom, Dan Hardy from Crowdcube, and Oliver Woolley from Envestors. 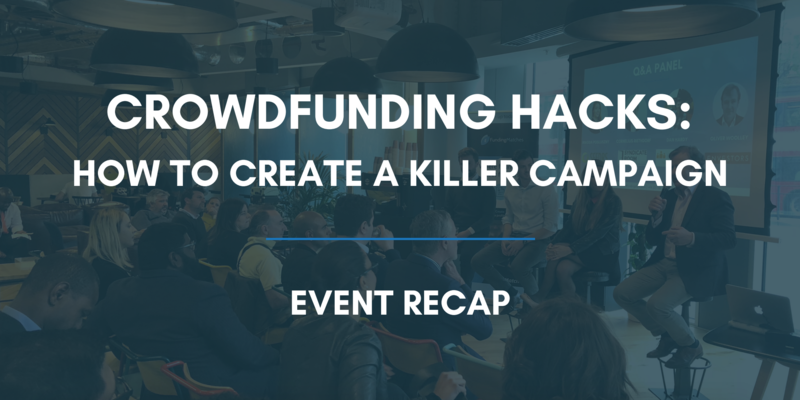 Crowdfunding can be fast, but it’s often part of a longer funding process. Campaigns on Seedrs, for example, require about two months in total for preparation plus campaign. Often, however, crowdfunding will be part of a mix of funding sources, including angel and VC investors, which can take longer to secure. Other platforms, such as SyndicateRoom, require such a mix, as businesses cannot be listed until they’ve secured one or a team of lead angel investors. Overall, in fact, funding rounds are taking longer: estimate 12 months rather than 12 weeks. Some platforms market to the public, while others keep the deal within their network. For example, while SyndicateRoom will generally not advertise a campaign beyond the high-net-worth individuals registered with them, Seedrs has in-house PR and marketing teams that work exclusively on spreading the word about the businesses on their platform. This is why it’s important to understand what you’re looking for in a platform. While many fit the loose definition of ‘crowdfunding,’ their approaches can vary widely. Clarity of expression is key in a campaign. Entrepreneurs often struggle to communicate what they do and what value they provide in basic, simple terms. Most will need to give careful thought to how their campaign, especially the all-important campaign video, will convey their message to a hugely diverse crowd of potential investors. “Explain in a way your mother could understand it,” advises Hardy. Expect ups and downs over the course of a campaign. Crowdfunding campaigns tend to have a particular arc to them: big opening week, then a slowdown during the middle of the campaign, ending in a rush at the finish. Plan to stagger your efforts to market your campaign and reach out to potential investors throughout the campaign period, and don’t be disheartened by the slump toward the middle. It’s critical to keep your valuation realistic. An unrealistic valuation is one of the main reasons businesses fail to reach their funding goals. What makes a valuation ‘unrealistic’? For one thing, it can’t be based on predictions about your business’s future performance. Savvy investors know that only 4% of businesses reach their ‘highly conservative’ estimates of their own future success. Lower valuations rooted in reality will get you much farther than any prediction of the future. Entrepreneurs should be engaged in the process of campaigning. Business owners need to actively prepare for and build momentum around their campaign, making their campaign as airtight and unique as possible. Gathering interest from customers rather than professional investors is a great way to stand out. It can also help to go back to investors who rejected you in the past and ask if they’d like to invest a smaller sum of their personal funds into your campaign. Also, reply immediately to any messages from potential investors. Getting listed on a crowdfunding platform and reaching your funding target is far from easy, but it’s also far from impossible. Choose your platform carefully, plan meticulously for a campaign with a clear message, and continue other fundraising efforts, and you will be well on your way. Now that you understand a bit more about crowdfunding, connect with UK platforms and other funders over drinks and snacks at our next event, ‘Networking with Funders’ on 30th May at WeWork Aldgate! Secure your ticket here.